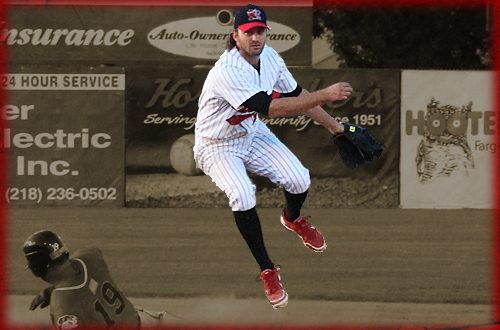 American Association All-Star SS Zach Penprase has re-signed with the Fargo-Moorhead RedHawks for the 2013 season. Penprase will be in Fargo when the club opens training camp in early May. Penprase, 28, batted .311 with 16 doubles, three triples, six home runs and 46 RBIs in 97 games. He led the American Association in both runs scored (95) and stolen bases (47), finished third in walks (73) and fourth in on-base percentage (.424). Penprase was an All-Star in the field as well in 2012. He led all league shortstops in total chances (507), put outs (151), assists (334) and double plays (89) in helping Fargo-Moorhead to a league-best 65-35 regular season record. Penprase spent this winter playing for the Sydney Blue Sox of the Australian Baseball League. He batted .282 with nine doubles, two triples, two home runs, 16 RBIs and 30 run scored in 45 games as the Blue Sox advanced to the ABL Championship Series. Penprase also stole 16 bases, which established a new ABL record. In five seasons with Fargo-Moorhead, Penprase has batted .291 with 88 doubles, 14 triples, 24 home runs, 209 RBIs and 376 runs scored in 445 games. He also holds the RedHawks career record with 189 stolen bases.